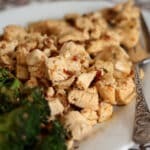 Steaming hot bites of chipotle ranch flavored chicken, dipped into cold ranch dressing made for a fun and fast dinner. I tossed the broccoli into the pan right after the chicken (much like I did with this zucchini) and it absorbed the spices and sauce as it cooked. The total cooking time for this meal was less than ten minutes. That is my kind of summertime dinner! Dice the chicken into 1/2" pieces, removing any fat as you dice. Place the diced chicken in a gallon size ziploc bag. Place three chipotle peppers on the cutting board and chop them until they are finely minced. Scrape the peppers and any juices into the bag with the chicken. Add the ranch dressing and seal the bag, pressing any air out of the bag. Squeeze the bag to thoroughly combine the chicken and the marinade. Let rest on the counter for half an hour. Warm the oil in a very large skillet over high heat. Add the chicken to the skillet and stir or toss with tongs as it cooks. This only takes a few minutes. Immediately remove the chicken from the skillet as soon as the pieces are cooked through. If you leave them in the skillet or cook them too long, the chicken will dry out. 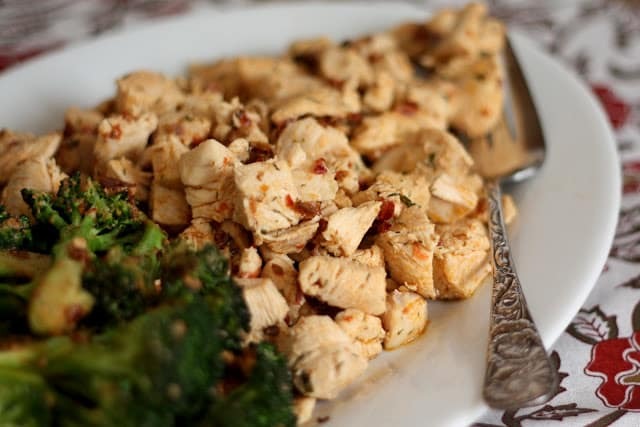 As soon as the chicken has been removed from the skillet, slightly reduce the heat to medium high and add the broccoli to the remaining juices and chipotle bits. Toss constantly while it cooks. It will turn bright green and then start to soften. I wanted a crunchier broccoli this time, so I took it out of the pan just a minute or two after the color brightened. Let it cook just until it is as soft as you like and then remove it from the hot pan. 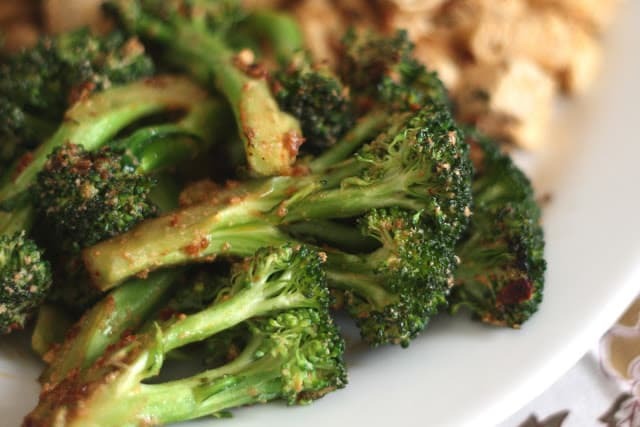 Serve with cold ranch dip on the side while the chicken and the broccoli are piping hot. Enjoy! I'm really into chipotle these days and this sounds perfect. LOVE the broccoli - great idea to use the same pan. Not only do you have less to clean up - it pulls in the flavor for a perfect meal! I've done chipotle chicken before...but never with ranch too! Will definitely be making this soon! I just love that this recipe calls for homemade ranch dressing. Perfect! Perfect simple dinner. We are really enjoying chipotle lately. Will Try This One For Sure..! I love cooking with chicken bites too, Mary... Do you think one can cut up the chunks into cubes, and then freeze, or is that not good food safe practice? You definitely can. I often prep chicken into the size cuts I want to use prior to freezing it. As an added benefit, if you press it flat in the bag, it will freeze faster and the pieces will thaw more quickly as well. Good luck! That's my kind of summer dish too! My youngest daughter doesn't like much, but she likes chicken, ranch dressing and broccoli. This dish sounds very promising! Sounds like a delicious quick meal full of flavor. sound light, healthy and good! the boys will be back next week and I think this is one that they would like a lot.